Hydro is another more "recent" character I cooked up. He hails from the RPG I ran that spawned the ideas that formed the basis for this comic. 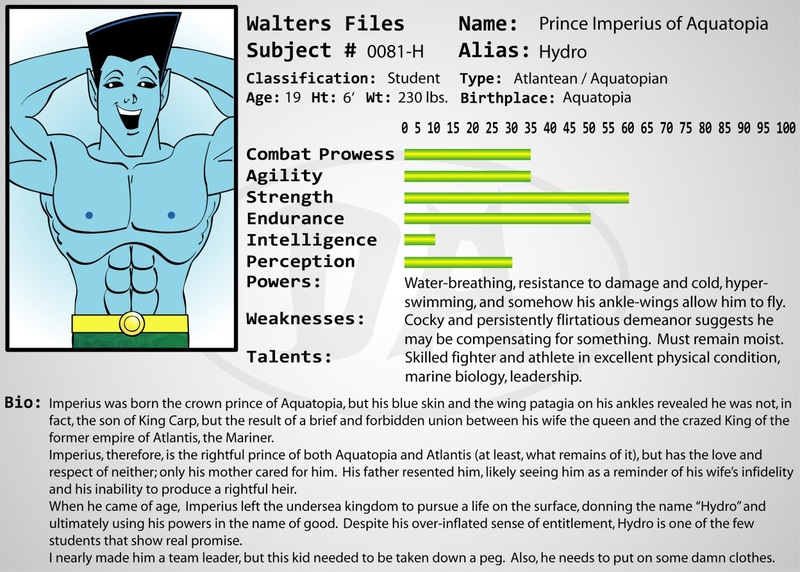 In that game, which took place in a near-future world that was an amalgamation of the DC and Marvel universes, Hydro was the son of Namorita and Nova, so, as you might imagine, his power set was significantly more diverse. In the Super U-niverse, he's the child of an evil Namor-like figure and the queen of my Aquaman parody (King Carp), but I'm going to leave the details of those characters primarily to Jason and his Saturday Super Stories. Jason and I decided at least one of the students should be gay, but I didn't want to have a gay character just for the sake of having one, nor did I want the character to be stereotypically flaming gay, so I liked the idea of Hydro trying desperately (and sometimes failing badly) to be in-the-closet. In fact, Hydro even tries to convince himself that he's straight. Beyond that, though, Hydro hasn't changed much from the game. Only now, his persistent advances on his female classmates are a front; a rouse that, really, only fools himself. I know I've said this about just about every other character so far, but I really like Hydro, and I expect to use him quite a bit more in the strips to come. I like the way he puts himself out there as a popular and fun-loving character, and he is those things, but the real Hydro struggles with his own identity and with his troubled upbringing... a struggle that often finds him in the company of the "outcasts" of the school like Aiden, Chance and Richie.